RW (REGIONAL WINNER) В КОТЯТАХ!!! IW (INTERNATIONAL WINNER) ВО ВЗРОСЛЫХ!!! - 13 th КОТЕНОК РЕГИОНА СЕВЕРНАЯ ЕВРОПА (EN, Europe North)! REGIONAL WINNER!!! - 8 th ДЛИННОШЕРСТНЫЙ КОТЕНОК РЕГИОНА СЕВЕРНАЯ ЕВРОПА (EN, Europe North)! - 2 th КОТЕНОК ХАЙЛЕНД-ФОЛД В МИРЕ! - 9 th ВЗРОСЛЫЙ РЕГИОНА СЕВЕРНАЯ ЕВРОПА (EN, Europe North)! - 5 th ДЛИННОШЕРСТНЫЙ ВЗРОСЛЫЙ РЕГИОНА СЕВЕРНАЯ ЕВРОПА (EN, Europe North)! - 1 th ВЗРОСЛЫЙ ХАЙЛЕНД-ФОЛД РЕГИОНА СЕВЕРНАЯ ЕВРОПА (EN, Europe North), ЛУЧШИЙ ВЗРОСЛЫЙ ХАЙЛЕНД-ФОЛД РОССИИ!!! 2 th ВЗРОСЛЫЙ ХАЙЛЕНД-ФОЛД В МИРЕ!!! - 1 th ДЛИННОШЕРСТНЫЙ ВЗРОСЛЫЙ РОССИИ!!! - 23 th ДЛИННОШЕРСТНЫЙ ВЗРОСЛЫЙ МИРА! INTERNATIONAL WINNER!!! RW (REGIONAL WINNER) – KITTENS!!! IW (INTERNATIONAL WINNER) – ADULTS!!! - 13 th BEST KITTEN OF EUROPE NORTH (EN)! REGIONAL WINNER!!! - 8 th BEST LONGHAIR KITTEN OF EUROPE NORTH (EN)! 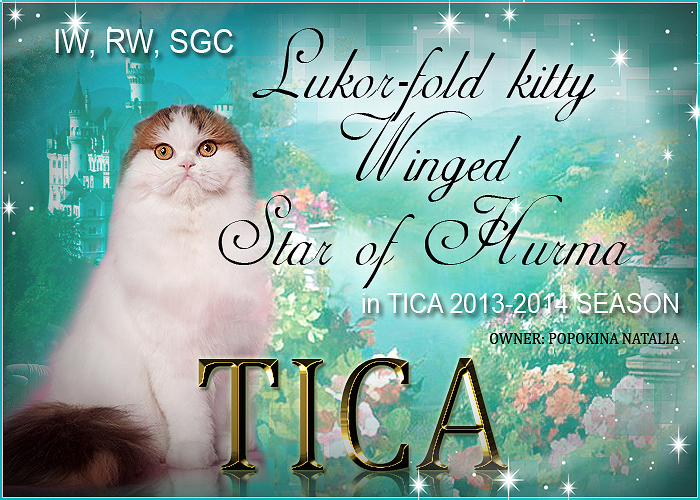 - 2 th BEST HIGHLAND FOLD KITTEN IN WORLDWIDE! - 9 th BEST ADULT OF EUROPE NORTH (EN)! - 5 th BEST LONGHAIR ADULT OF EUROPE NORTH (EN)! - 1 th BEST HIGHLAND FOLD ADULT OF EUROPE NORTH (EN)! BEST HIGHLAND FOLD ADULT IN RUSSIA! 2 th BEST HIGHLAND FOLD ADULT IN WORLDWIDE!!! - 1 th BEST LONGHAIR ADULT IN RUSSIA! - 23 th BEST LONGHAIR ADULT IN WORLDWIDE! INTERNATIONAL WINNER!!! RW (REGIONAL WINNER) ВО ВЗРОСЛЫХ!!! - 19 th ВЗРОСЛЫЙ РЕГИОНА СРЕДНЕЙ АТЛАНТИКИ (MA, MID ATLANTIC)! - 11 th ДЛИННОШЕРСТНЫЙ ВЗРОСЛЫЙ РЕГИОНА СРЕДНЕЙ АТЛАНТИКИ (MA, MID ATLANTIC)! - 1 th ВЗРОСЛЫЙ ХАЙЛЕНД-ФОЛД РЕГИОНА СРЕДНЕЙ АТЛАНТИКИ (MA, MID ATLANTIC)!! - 6 th ВЗРОСЛЫЙ ХАЙЛЕНД-ФОЛД В МИРЕ!!! RW (REGIONAL WINNER) – ADULTS!!! - 19 th BEST ADULT OF MID ATLANTIC (MA)! - 11 th BEST LONGHAIR ADULT OF MID ATLANTIC (MA)! - 1 th BEST HIGHLAND FOLD ADULT MID ATLANTIC (MA)! - 6 th BEST HIGHLAND FOLD ADULT IN WORLDWIDE!! !